Smoke Sabre is a major step forward in the design of smoke detector testers. All other pressurized aerosol smoke alarm testers have the inherent drawback that, if misused, they leave harmful residue on the casing and / or inside the chamber of the detector. This residue can discolor the detector plastic, can attract dust, affect sensitivity and, in some cases, lead to corrosion, cracking or even complete failure of the detector. Residue occurs when testing aerosols are used too close to the detector, or smoke alarm, despite instructions not to do so. 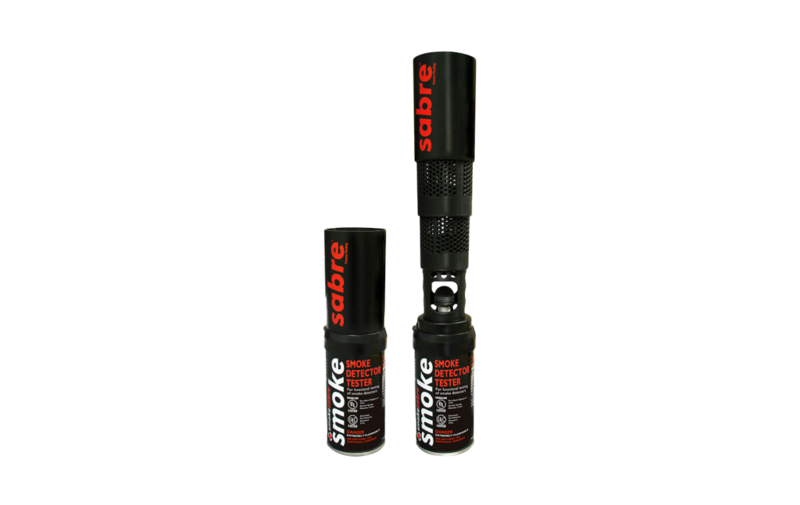 Smoke Sabre cannot be used too close to the detector and eliminates harmful residue while focusing and targeting the canned smoke test gas. When Smoke Sabre is in the closed position the sabre prevents access to the spray button. The aerosol can only be activated when the sabre is fully extended. In use, air is drawn through the holes in the sabre and this, coupled with the venturi effect involved, assists the velocity and vaporization process of the airborne ‘smoke’ particles. The result is a more effective test, delivering better detector activation, using less gas per test, and reducing costs while eliminating harmful residue. Other products may be recommended as best used with accessory devices to prevent spraying too close. With Smoke Sabre there is no choice. The sabre is part of the product and cannot be used without it! 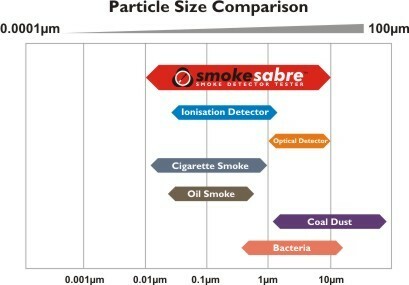 Smoke Sabre is a universal test product covering the sensitivity range of all smoke detectors (see particle size comparison chart). The extending sabre is made of 100% bio-degradable plastic making Smoke Sabre the only smoke detector test aerosol to be both recyclable and eco-friendly. Smoke Sabre is UL and ULC listed, meets global testing standards, and is approved by major smoke detector manufacturers.